For safety’s sake I continued walking along on the Derwent River side rather than on the road side of the guard rail, although there were moments when the edge fell away and so I was forced temporarily back onto the road. This stage certainly would not be one that someone using crutches or a wheel chair could follow. There were no official paths and so I made do with whatever I could in terms of a suitable walking path. I enjoyed this part of the walk observing more black swans in pairs and families of ducklings out for a paddle. At the end of the bay of Risdon Cove, I exchanged friendly greetings with a couple of woman who were selling bunches of colourful flowers from the boot of their car on a set back on the other side of the road. I continued up an incline still on the ‘safe’ side of the railing amidst blown and thrown rubbish, tall weeds, and native grasses. Whispering casuarina trees separated me from the River. Clearly people have walked here before but it is a rough ‘non-path’. At 9.54am I reached the turn off signposted to Bridgewater, began the left hand walk downhill, and passed the furry remains of dead possums (unfortunately ex- road-kill). To my right, on the other side of the road, the 19th century heritage listed Cleburne Homestead and its scatter of old sandstone buildings popped occasionally into view through large trees and bushes. The Homestead operates as a luxury bed and breakfast art hotel style establishment (http://www.visitcleburne.com.au/). 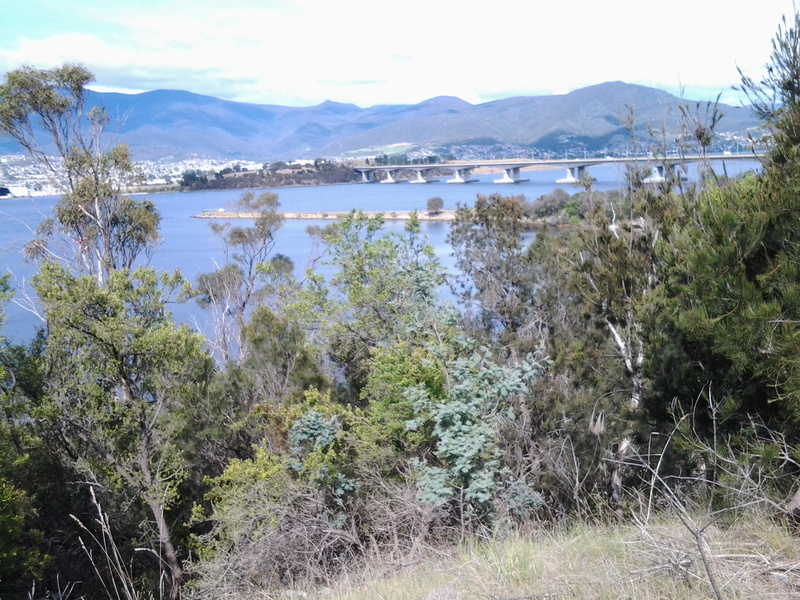 The photo below shows the Cleburne Spit which inserts itself into the Derwent River, with the Bowen Bridge crossing the River in the distance. At 10am I arrived at the junction road leading left to the Cleburne Spit. 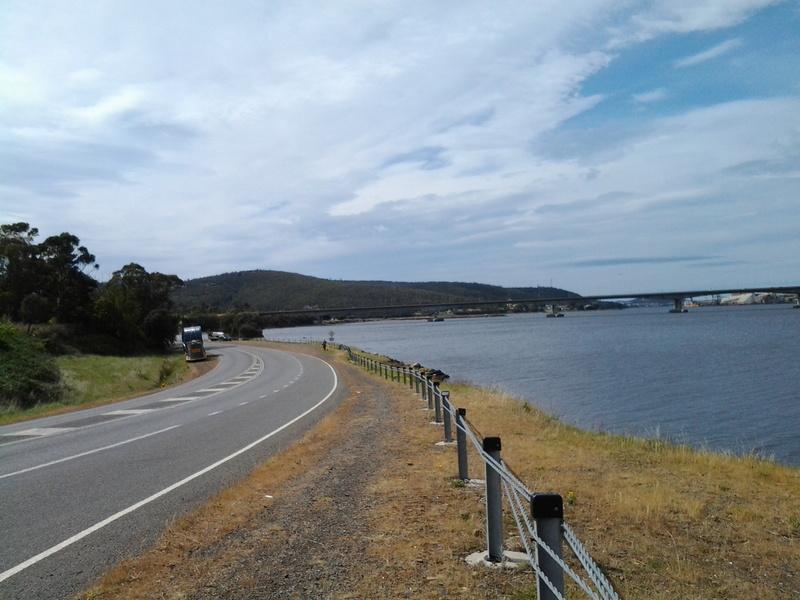 The Spit looked very much like a man made raised wall approximately one or two car widths wide that extends out in a straight line into the Derwent River. Perhaps it was a series of rocks that once could be walked upon and then someone dropped filling rocks to create a breakwater to fish from or some other activity. I wonder what the real story is. My guess is that the Spit was named after 19th century settler Richard Cleburne. He was an interesting character who had a property in the area and was suspected of smuggling. Did the Spit figure in such illegal activities I wonder? More information about Richard can be read at http://adb.anu.edu.au/biography/cleburne-richard-1903. 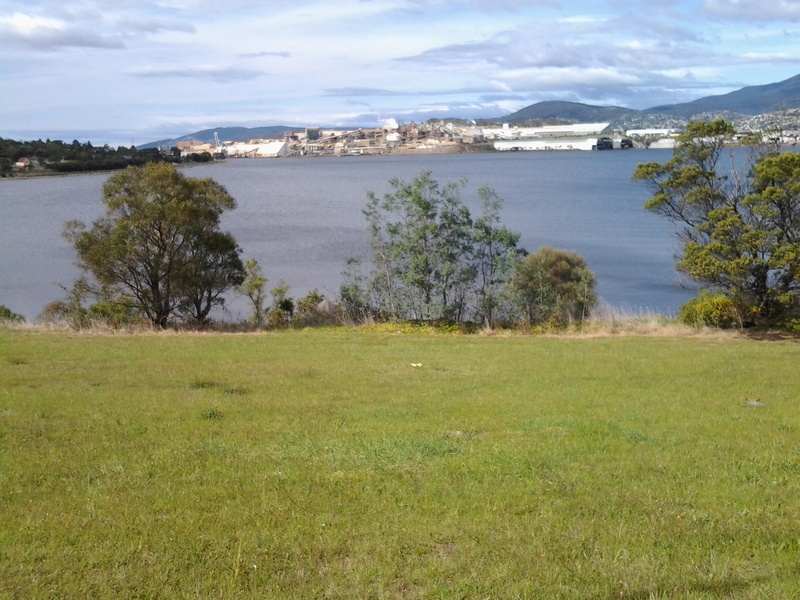 My view across the Derwent took in the noisy Nystar works previously seen and heard on Stage 6 of the walk. Immediately next to Nystar and further north, I could see another major industrial site: Incat, a manufacturer of very large catamarans. In the photo below, a massive white structure has two dark ends. Inside each of these spaces, a new catamaran is being built – usually for an overseas market. The East Derwent Highway curved in a sweeping right-hand bend from its junction with the road to Cleburne Spit. I walked straight ahead to the River and then curved around to the right keeping parallel with the Highway. 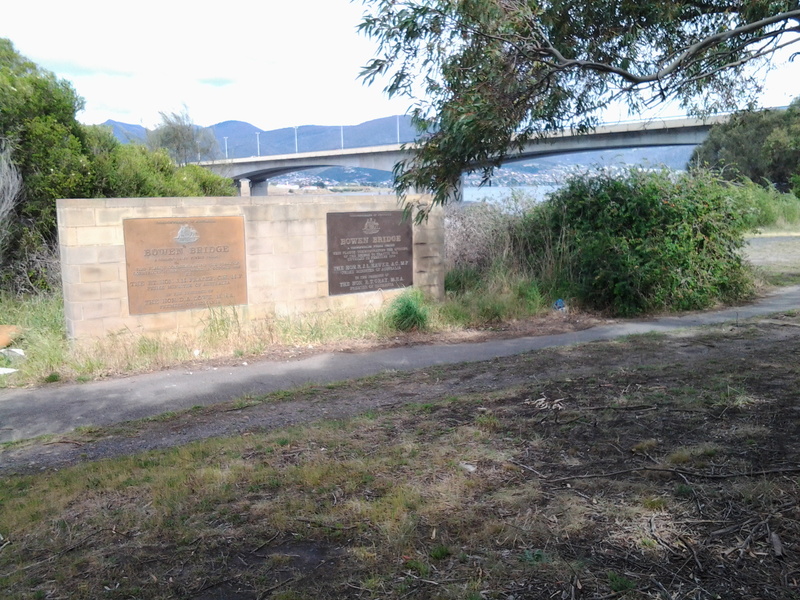 Amidst discarded rubbish, straggling weeds and under the casuarina trees I discovered two plaques: one commemorating the beginning of the building of the nearby Bowen Bridge and the second marking the official opening ceremony of the Bridge. On both occasions an Australian Prime Minister was given the honoured task. Two very strong and formidable men: Malcolm Fraser began the bridge and Bob Hawke opened the bridge. I followed a short bitumen pathway and stood underneath the Bowen Bridge a few minutes after 10am. Eventually I walked beside the guard rail and, depending on the safety of the ‘non-path’, I walked on one side or the other. Sometimes there was a sandy rough drop to the water below, and sometimes I was walking next to the River at ‘sea level’. By 10.07am I reached the sign indicating I had moved from the Risdon area into the Otago Bay suburb. At 10.11am another sign gave me advance warning that Otago Bay Road was up ahead. In a pull-off-the-road siding, a middle aged man wearing clean moleskin trousers and a sporting peaked cap advertised new season South Arm Pink Eye potatoes. The back of his truck was open and he sold his vegetables to people who, once their cars had skidded to a halt on the gravelly surface, climbed out of their vehicles for a stretch and then a leisurely meander over to check the goods. There was something slightly furtive about the way he wouldn’t meet my eyes which left me wondering why. The photo below looks southward towards the Bowen Bridge. One of the vehicles in the distance on the right is the truck selling the potatoes. At 10.18am I turned left off the East Derwent Highway onto Otago Bay Road. The sound of traffic in the distance as it poured along the Highway, and the way the wind boxed my ears, meant it was difficult to hear cars coming behind me. Constantly I was watching my back as I walked along non-existent road verges. I did not discover a safer path for this part of the walk. Earlier, near the Cleburne Spit, I had exchanged brief friendly words with a woman walking southwards with her dog. When she caught up with me on her northward return journey, we found we had a great deal in common and spent some time walking together towards Otago Bay. 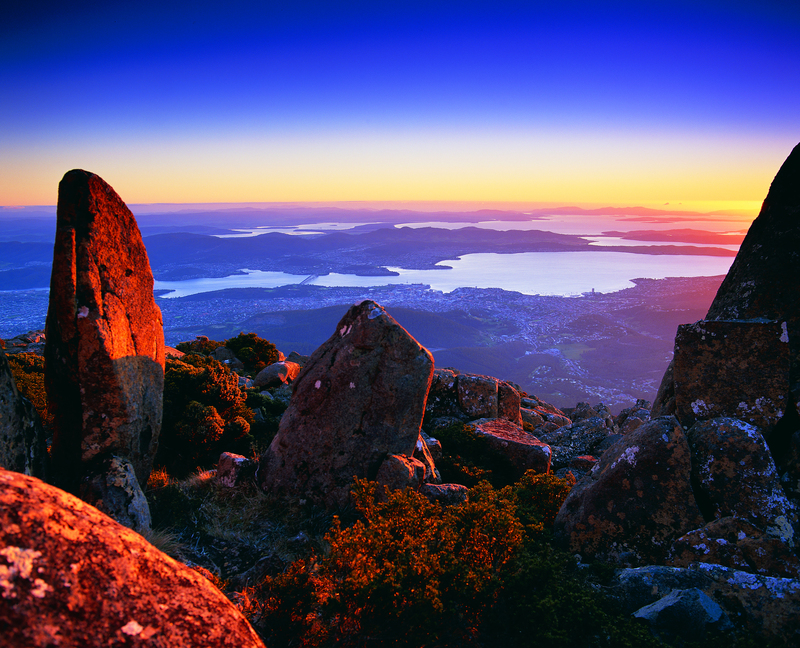 This entry was posted in Derwent River, Hobart, Mount Wellington, Walking and tagged Bowen Bridge, Bridgewater, catamarans, Cleburne Homestead, Cleburne Split, East Derwent Highway, Incat, Nystar, Otago Bay, Otago Bay Road, Pink Eye potatoes, Richard Cleburne, Risdon Cove, smuggling on November 4, 2014 by Tasmanian traveller.